Deck the halls with one of the most fabulous Drag Race alumnus. 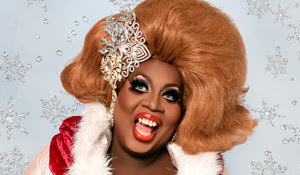 The big and brazen Latrice Royale brings some holiday joy, and some special guests, to the Laurie Beechman in Why It Gotta Be White Christmas? An evening of song and banter, Latrice asks the age-old question why does it have to be a white Christmas. Sharing tales of holidays in Compton and her feelings after her very first snow, Latrice brings down the house with her booming vocal and an exuberance of charisma. The evening was mostly made up of classic Christmas jingles mixed with some hilarious parodies in the form of turning “Winter Wonderland” into a ditty about wearing women’s underwear and the show stopping “12 Gays of Christmas.” What made the latter a smash was the character cameo of the Kennedy Davenport created Merlene Watkins. The big-behind church lady put Kennedy’s comedy on display. Vowing to be a good Christian woman, Kennedy’s Merlene had no problem upstaging Latrice. And Latrice let her. When she returned as Kennedy, she showed off her pristine vocal skills. If this wasn’t a plea for her own headlining show at the Laruie Beechman, I don’t know what is! Though neither outfit read as holiday attire to the blind eye, Latrice and Kennedy both shimmered on stage in their stones. The overall pacing of the show felt a bit slow with a lack of content. Perhaps a song or two more was what was desired. And in the spirit of the holidays, an uptempo encore is what would have capped off the night best. Why It Gotta Be White Christmas? was a nice holiday treat. There’s a little bit of joy for everyone. But the biggest gift of the night was Latrice’s holiday guest, Kennedy Davenport.